I’ve received several photos of amazing vegetable arrangements from my students and I wanted to share their beautiful carvings with you. Perhaps these photos will serve as inspiration for one of your next vegetable arrangements. Smita Jaiswal created these adorable tomato basket carvings and stuffed them with a veggie mixture. Don’t they look lovely as part of the flowery vegetable arrangement? Smita’s tomato baskets is a cute idea for Easter because they are like mini Easter baskets. 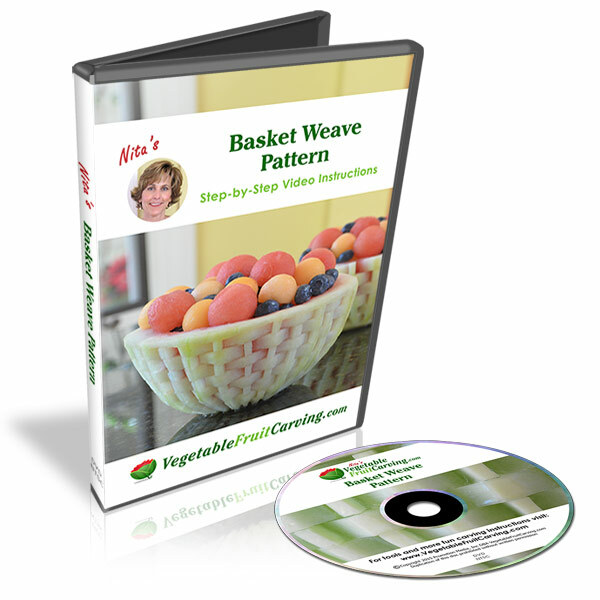 Vegetable Arrangements for Easter or any time of year. Smita’s tomato baskets and carved veggie flowers make this vegetable arrangement a truly unique set of carvings. Ric Testani shared a couple of photos of his vegetable arrangements. 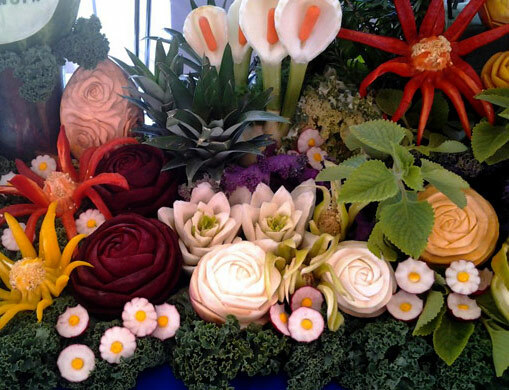 The first photo is a beautiful vegetable carving display featuring an assortment of veggie flowers. The small radish flowers on the bottom of the photo can be learned in my free video, which you can sign up for here: Free Radish Flower Lesson. 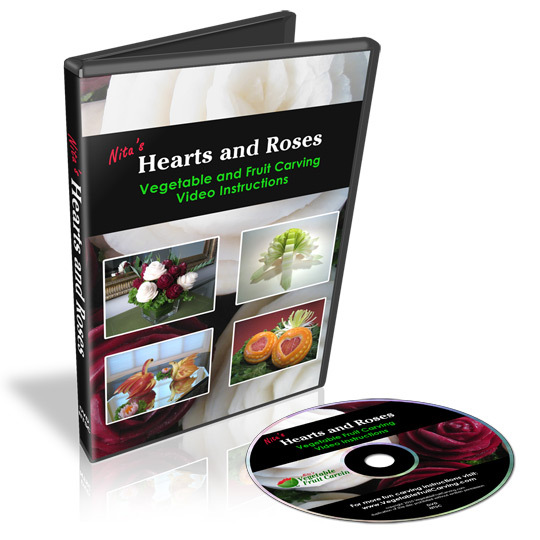 The other flowers, including the red and yellow chili pepper flowers and the beet roses, are featured in my Vegetable and Fruit Carving 101 Course and Hearts and Roses, respectively. 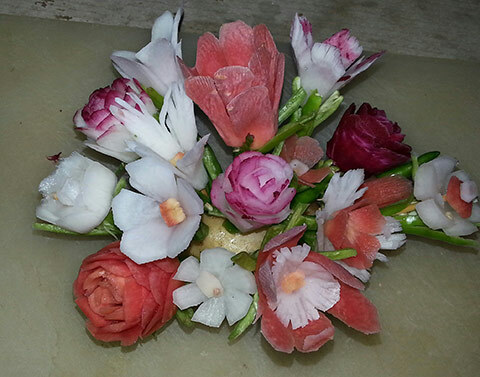 Ric Testani showcases a wide array of veggie flowers in his version of vegetable arrangements. Here Ric shows an example of a watermelon radish flower carving. The vibrant magenta color of the inside of the watermelon radish makes for a gorgeous rose carving. 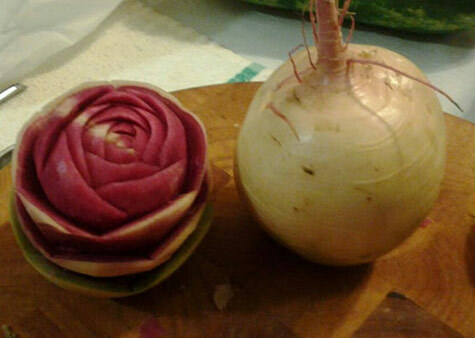 Before and after of a watermelon radish rose by Ric Testani. If you are considering carving for Easter the color of the watermelon radish fits in with the purples often used at Easter. Thao Nguyen created a wonderful veggie bouquet that shows off another side of vegetable arrangements. In addition to the radish daisies, there are also fennel calla lilies with tomato accents. 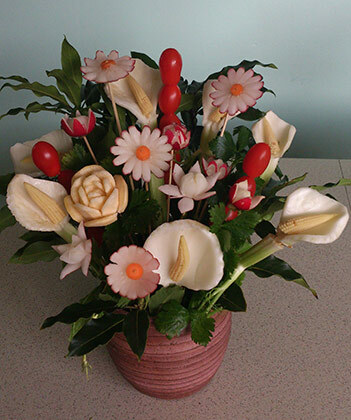 Thao’s brilliant vegetable bouquet highlights several types of veggie flower carvings. Sakina Mohammed also created a veggie bouquet to show off her vegetable arrangement skills. However, she used daikon and dyed them using food coloring. When you start with diakon, jicama, or white turnips, and use food coloring you can create any color scheme that you like. 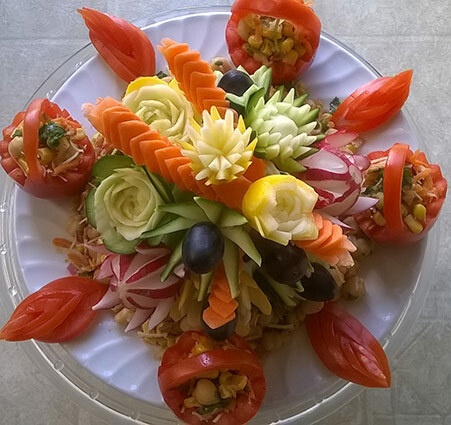 Sakina’s vegetable arrangement features beautiful flower carvings. Vegetable arrangement are a fun, creative way to show off your carving skills to your friends and family. Hopefully these examples of vegetable arrangements will inspire you to create your own! I truly enjoy EVERY email from you. I love seeing what everyone created and the fun things they use to carve and the wonderful creations they do. Thank you for sharing.